AMD had some news to share yesterday regarding its enthusiast-grade Threadripper CPUs as well as the budget-focused Ryzen 3 at the other end of the spectrum. While we now know specs and pricing for their range topping CPUs, the company left out pricing details for Ryzen 3. If a recent leak is to be believed, however, the lineup is set to start at just $109 for the Ryzen 3 1200 and $129 for the 1300X. That’s incredibly good value considering that — at least on paper — the chips are in Core i5 territory in terms of compute performance. As a refresher, the lower end Ryzen 3 1200 features base and boost frequencies of 3.1GHz and 3.4GHz, while the 1300X features base and boost frequencies of 3.5GHz and 3.7GHz. They both pack four cores and four threads (no SMT support) and will fit into current AM4 motherboards. Moreover, unlike Intel’s counterparts, AMD’s entire lineup is overclockable, opening up the potential for even better value for budget builders — it remains to be seen how well they overclock, though. The leak came from a poster on reddit — first spotted by Wccftech and reported by Forbes — who claims to have obtained the information from a distributor in his country. 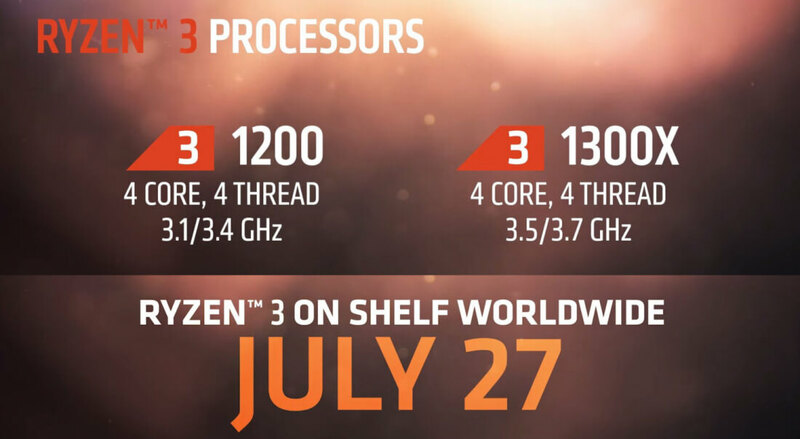 We won’t have to wait much longer to see if the information check out as Ryzen 3 is slated to arrive on July 27. In the meantime look out for our Ryzen 3 preview next week. We'll tweak current Ryzen chips to match the specifications of the upcoming budget processors and simulate their performance so you can know what to expect ahead of release.